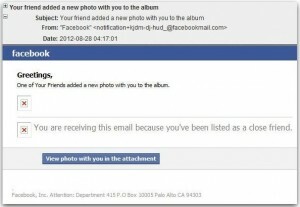 Have you received an email saying a friend tagged you in a photo on Facebook? Use extreme caution before clicking to see photos in the attachment. In a typical phish, cybercrooks are using a fake Facebook photo notification email designed to spread malware allowing them to gain control over Windows-based computers. Avast Virus Lab detected the malware as Win32:Trojan-gen and added the definition to the database yesterday, so all avast! users are protected. The email looks innocent enough with the familiar blue header and logo. Serious Facebookers may know that Facebook never sends you photos that you’ve been tagged in as attachments; rather they send links to the photos. Unfortunately, most of us are too busy to notice the difference. Please share this warning with your Facebook friends, and recommend that they get avast! Free Antivirus, so they’ll always be protected. You can share avast! by clicking on our recommend avast! app here.